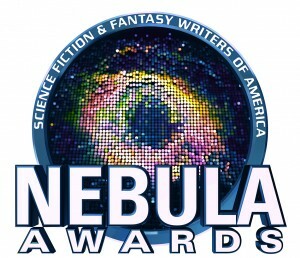 Ken Liu has won the Nebula, Hugo, and World Fantasy Awards and been a finalist for the Sturgeon and the Locus Awards. 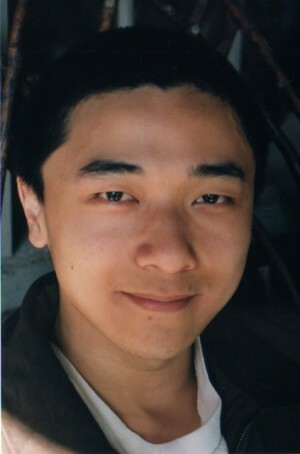 His debut fantasy novel, THE GRACE OF KINGS, was published by Simon & Schuster’s Saga Press imprint in 2015. 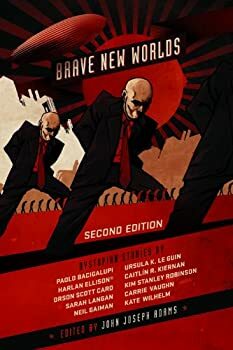 Saga will also release a collection of his short fiction. 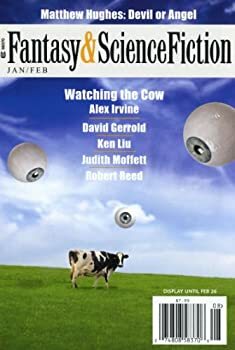 A programmer as well as a lawyer, Ken has published stories in F&SF, Asimov’s, Analog, Strange Horizons, Clarkesworld, and Lightspeed, among other places. 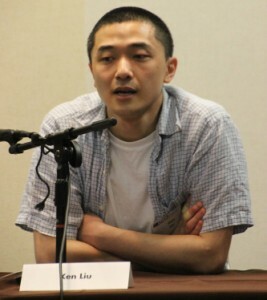 Besides writing original fiction, he also translates fiction from Chinese into English. He lives in Massachusetts with his wife and daughters. 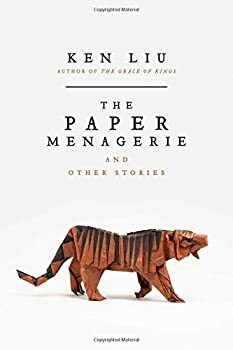 Click here for more stories by Ken Liu. 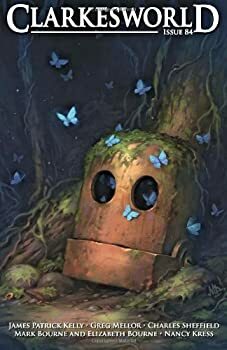 Today Ken Liu stops by to answer a few questions about his newest work The Grace of Kings, the first in a series of “Silkpunk” and an ambitiously structured novel that won me over for its change-of-pace narrative construction and original setting, as well for its somewhat rare focus on social and technological change in a fantasy world. We'll be giving away a copy of The Grace of Kings to one random commenter with a U.S. address. 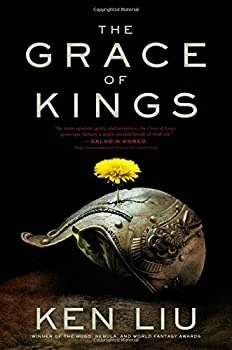 The Grace of Kings, by Ken Liu, is a book that took a good deal warming up to for me, so much so that I considered giving it up multiple times through the first few hundred pages. Seriously considered giving it up. 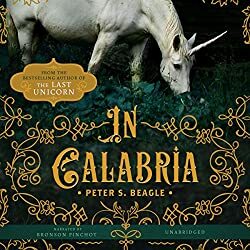 The episodic structure, which I’m generally not a fan of just as a matter of personal taste, was off-putting and distant, while both the characters and the plot felt more than a little flat. So the idea of continuing on for another 500 and then 400 pages in the same vein was not all that enticing. 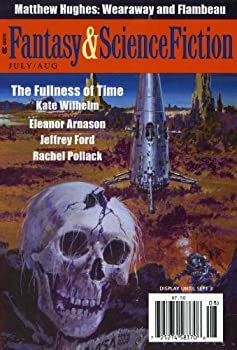 The May/June issue of Fantasy & Science Fiction is bookended with stories about music by two stalwarts of the field, Chet Williamson and Kate Wilhelm. Both demonstrate that they still wield a strong pen; both tales are excellent. 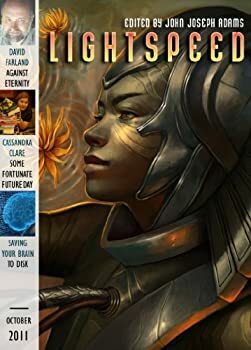 Issue 84 of Clarkesworld begins with “Mar Pacifico” by Greg Mellor, which I found to be one of the two best stories in this issue. 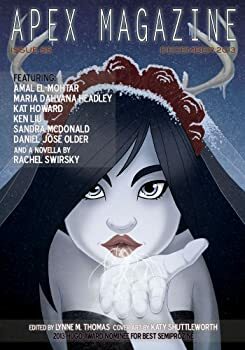 It’s hard to resist a story that starts, “A pale dawn spread across the Pacific as my dead mother emerged from the waves.” The first person narrator’s mother is formed by a bloom of algeron. Algeron developed from nanotech built by humans “to bring the carbon cycles back into balance and enhance the power of the oceans to absorb more carbon from the polluted air.” But as it evolved, it overran its safeguards and washed inland, absorbing nearly every living thing on the planet. The narrator and her daughter are the only ones left, so far as they know, and they are slowly starving to death. But the algeron seems to have achieved a sort of consciousness; it is able to assemble itself into a form the narrator recognizes as her mother. Ultimately, the narrator must decide whether to fight the algeron or work with it. The most recent two issues of Apex Magazine give us a chance to say goodbye to one editor and hello to the next, and offer an interesting contrast between two strong voices. 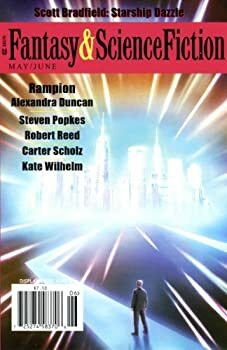 Issue 55 is Lynne M. Thomas’s last issue of the 26 she has edited. 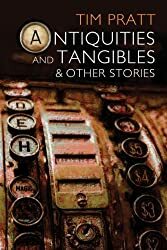 It is a strong issue, with stories that are beautifully angry — at disease, at societal expectations, at clichés. Hao Jingfang’s novella “Folding Beijing” stayed with me long after I finished reading it. 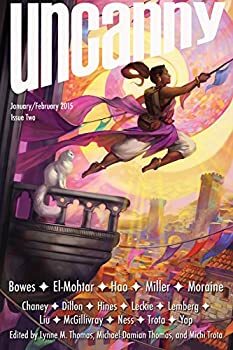 It wasn’t just the images of her fantastic city, where buildings fold down into cubes and once a day the entire city revolves like a tossed coin. 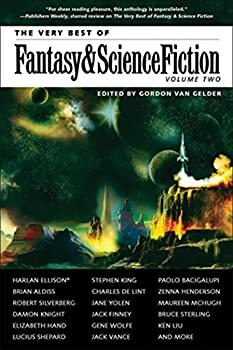 It wasn’t just the descriptions of the lives of people in Third Space, Second Space and First Space. 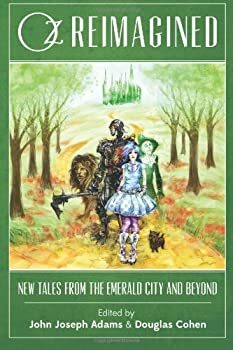 At the core of this story is an “ordinary” man, risking his freedom and maybe his life for money, and as his motives become clearer, I grew to care more and more about him. 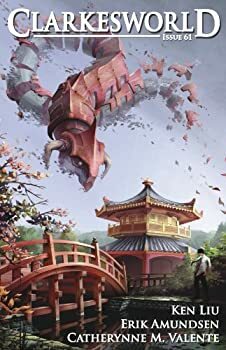 Folding Beijing by Hao Jingfang, translated by Ken Liu (2015, free at Uncanny Magazine, $3.99 Kindle magazine issue). 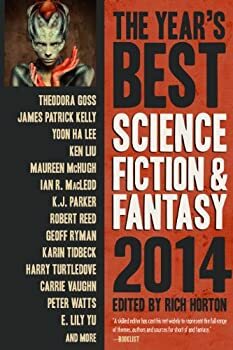 Nominated for 2016 Hugo award (novelette). 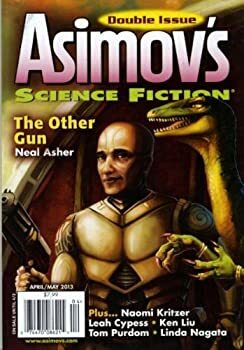 Short Fiction Monday: Sharing our finds in free and inexpensive short fiction available on the internet. 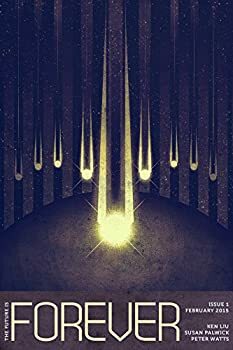 “Story of Your Life” by Ted Chiang (1998, originally anthologized in Starlight 2, reprinted in Stories of Your Life and Others). 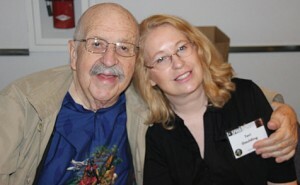 2000 Nebula award winner (novella) and 1999 Sturgeon award winner. “Writing the Other” looked like the staff of a think-tank. Saladin Ahmed (Throne of the Crescent Moon), Kim Stanley Robinson, (2312, which won the Nebula), Ken Liu (“Paper Menagerie”) and Aliette de Bodard (who would win for the novelette “Immersion”) made up the panel.